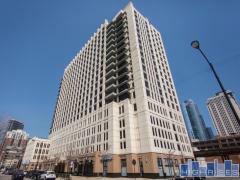 312 West Huron is a luxury high-rise condo building located in Chicago's River North neighborhood. The contemporary building is well equipped with an array of amenities including a yoga studio, pool, fitness center, running track, vegetable garden, dong run and much more. Residences feature expansive 2-3 bedroom floor plans with high-end custom finishes and the convenient location is just steps from River North's shopping, restaurants, and entertainment. Have any comments or questions about 312 West Huron? Ask your question and/or share your thoughts about this Building.